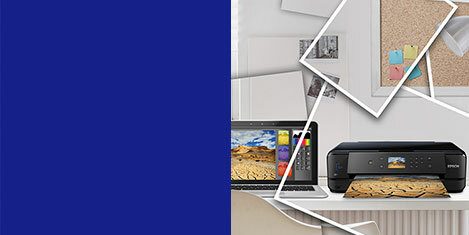 Advanced all-in-one printer with an ADF that produces outstanding glossy photos and documents, and comes with a range of easy-to-use features. 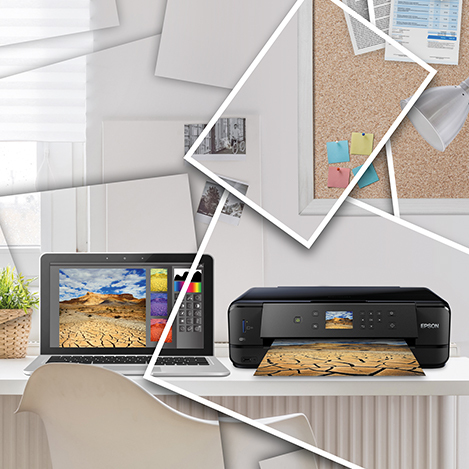 This stylish, top-of-the-range, compact all-in-one is ideal for busy households that want to print outstanding glossy photos and crisp, clear documents. 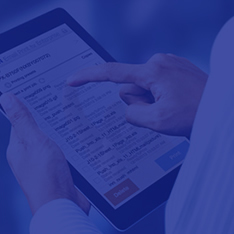 Wi-Fi connectivity and mobile printing offer great flexibility. This versatile all-in-one features an Automatic Document Feeder for scanning and copying multi-page documents, dual paper trays for A4 and photo media, double-sided A4 printing to save paper and a rear speciality paper feed for printing on thicker media. There’s a 10.9cm interactive touchscreen and a memory card slot for easy navigation and printing photos directly without a computer. It's also possible to print on suitable CDs and DVDs. 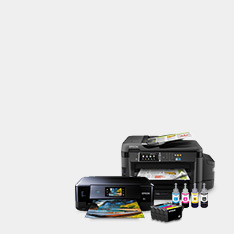 For even easier operation, a motorised control panel and output tray mean hassle-free printing. Don't waste your time - use the Automatic Document Feeder to quickly and easily copy and scan multiple documents. It will scan and copy up to 30 single or double-sided A4 documents automatically so there is no need to individually feed one sheet at a time. 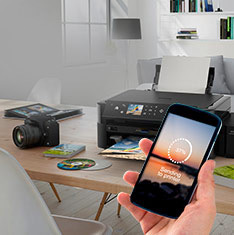 Print using smart devices with Epson’s free apps, Wi-Fi, and Wi-Fi Direct. 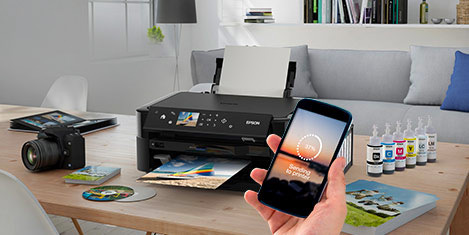 Print and scan wirelessly with Epson’s iPrint1 app or try Epson’s Creative Print1 app to print photos from Facebook, create greeting cards and more. 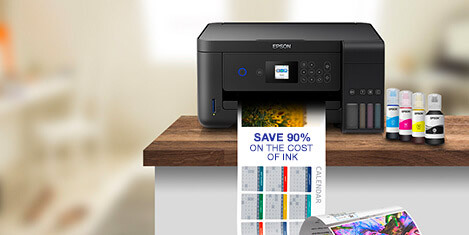 And print from almost anywhere in the world by emailing files to the printer with Epson Email Print1. It's one of those simple and handy features that often gets taken for granted, but it's surprising just how much time and paper A4 double-sided printing can save. It's easy to minimise your impact on the environment and reduce your paper costs simply by printing on both sides of a page. Save time with dual paper trays; load one with A4 and another with photo paper, so that you're always ready to press print. Use the built-in templates to create personalised calendars and greeting cards. Also print beautiful pictures and text directly on to suitable CDs and DVDs to keep track of what's on them. There’s a 10.9cm interactive touchscreen along with a memory card and USB memory stick slots for easy navigation and printing photos directly without a computer. Minimise your trips to the printer with a motorised control panel and output tray which opens automatically when a print job is sent. It's particularly helpful when you’re not close by the printer. Enjoy the beauty of high-quality photos and crisp, clear text documents with the five-colour Claria Premium dye and pigment ink set. Photos are crystal clear with vibrant colours and deep, rich blacks as Claria Premium incorporates a photo black ink cartridge. It’s economical too, as only the colour used needs to be replaced thanks to individual ink cartridges. To help reduce costs, our XL cartridges provide an economical solution for those who print frequently, letting you print over two times more pages2, compared to standard cartridges. 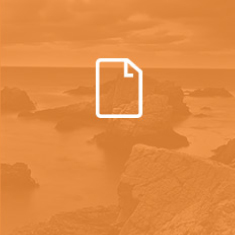 This significantly reduces the cost per page, helping you to save money. 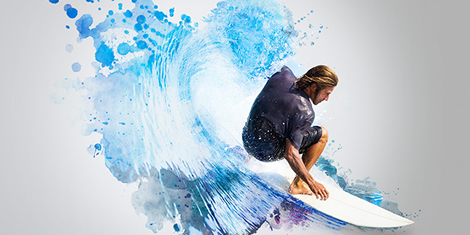 Online ink purchases can be conveniently delivered to you at home thanks to EasyMail packaging. What’s great is that we’ve specifically designed the packaging so that it’s compact enough to fit through most letterboxes, for when your post doesn't require a signature. That should prevent unnecessary trips to collect deliveries.